There are many ways to browse the information in this field guide, but the backbone of the site is the pages detailing information about individual species. Below is a sample page with a key describing the main features. The navigation bars at the top and bottom of each page allow you to quickly access the main features of the site. The common name and scientific name of each species are presented at the top of each page. An image of the entire organism is accompanied by general information about it as well as its location. Each species page contains a scanned leaf next to a ruler. For reference, this ruler is in inches and 1 inch = 2.54 centimeters. Wherever measurements appear in the text, both english and metric units are given. Clicking on the scanned leaf will open a new window with a larger image in high detail. 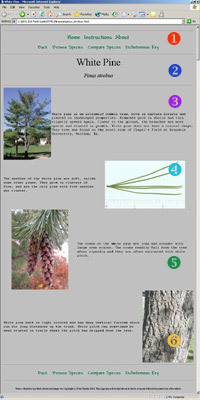 A description and picture of the cone of each species. A description and picture of the bark of each species. Additionally, clicking on highlighted, linked words within the text will open up a new glossary window defining that word. Click here to return to the main page and begin browsing species.